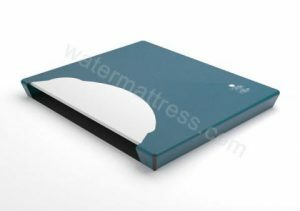 Besides Hardside Waterbeds and airbeds, United States Watermattress (USW) makes softside waterbeds. These together constitute USW's product line along with related items (components and accessories). 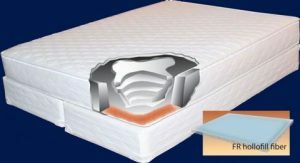 Their Softside waterbeds are listed in two categories: Softside Mattresses and Softside Systems. To understand this division, we need to know what a softside waterbed is. A hardside waterbed, the original kind, is a water-filled bag in a wood frame. The bag, usually made of heavy-gauge vinyl, is shaped like a mattress. The wood frame holds the mattress in shape, which forces the water to support anyone who lies on it. A softside waterbed, on the other hand, has its own support. 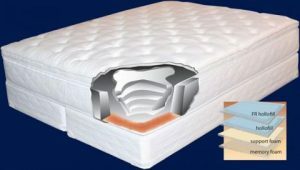 A stiff material, usually hard foam, is inside the enclosure of the mattress to hold the water bag in place. This way, the waterbed can look like a conventional mattress, Literally, it can stand on its own. 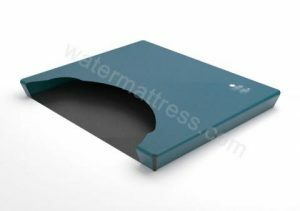 In the USW division, the Softside Mattress is the water bladder which is placed into the cover/enclosure. This not only allows it to look like a regular mattress; it lets comfort layers be added above to transition from firm support to a medium or plush feel. The water bladder can be shallow fill, medium fill, or deep fill. USW has four depths of softside water bladders: 6", 7", 8", and 9" deep. 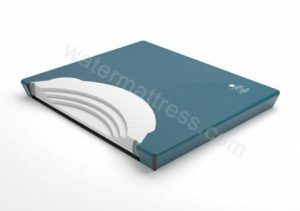 On its site, United States Watermattress lists seven softside water mattresses, based on how many fiber layers they have. On one retailer's site they have numerical model designations from 7000 to 7703 (the 7000 series). As with the Hardside Mattresses, the second digit indicates the number of wave-control fiber layers. A final 3 means it has three lumbar support layers. Standard features of USW softside mattresses are heavy-gauge vinyl (22 mil. ), reinforced corners (45 mil. ), and fiber layers of DuPont fiber (except in the 7000 Full Motion). A Softside System is the full mattress with the water bladder, enclosure (with rails), cushioning comfort layers, and the top cover. U.S. Watermattress lists six of these: Bally's, Doral, Riviera, Signature, Paradise and Mirage. The company says they can configure the softside system to the specifications of their customer (the retailer). 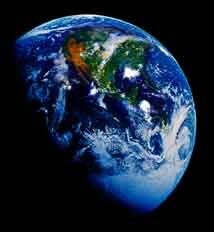 The systems can be logically divided into high and low systems. All systems have cover fabrics with anti-microbial treatment, quilted with fiber. All but Bally's add foam. The high systems also have a euro top or box top with 2" of foam. In each of these three systems the foam is different: convoluted polyfoam in Signature, memory foam in Paradise, and latex in Mirage. The top two models also have double zippers. Softside waterbeds by United States Watermattress are carried by several retailers. They have a 5-year warranty.